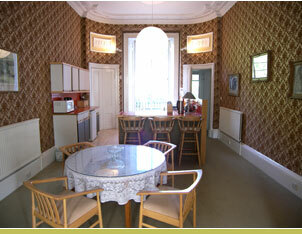 Explore Edinburgh city centre from a luxury base in our beautiful Dunstaffnage House Self-Catering Apartments in Regent Terrace! Peacefully located in a tranquil, cobbled street with period lighting in the East end of the city centre, Dunstaffnage House is a beautiful, 1830's, stone built town house, quietly located in a prestigious area of Edinburgh's new town. Each apartment sleeps up to 5. 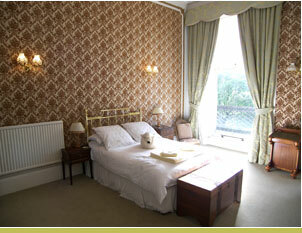 Only 7-8 minutes' walk to Princes Street, the famous Royal Mile and the Palace of Holyroodhouse. 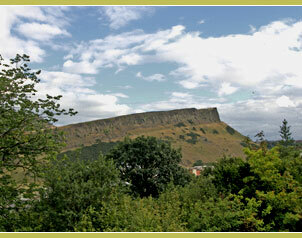 The apartments enjoy stunning views toward Queen's Park, Arthur's Seat and Holyrood Palace, and provide an ideal, central sight-seeing base for the many attractions that Edinburgh has to offer. 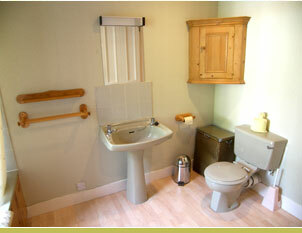 "Lovely accommodation, very deserving of four star rating (actually five). If we come back, we'll stay here again!" 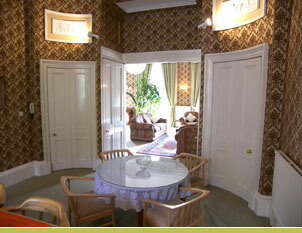 Extremely comfortable, centrally located, 4-Star-Rated accommodation. 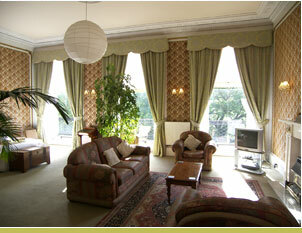 The apartments are centrally heated and very spacious with plenty of natural illumination. Each apartment comprises sitting room-come-dining room, beds for up to 4 people plus an additional fold-up bed, fully fitted kitchen with all appliances, shower and bath (some apartments have a power shower or jacuzzi bath). Included in the price of each apartment are all bed linen, towels, kitchen towels, toilet rolls, soaps, and a grocery starter pack which includes tea, coffee, sugar, milk, cooking oil, orange juice, preserves, spreads and bread rolls. Please use the 'Check Availability' form on the right to obtain a price quote for your group size taking season into account. 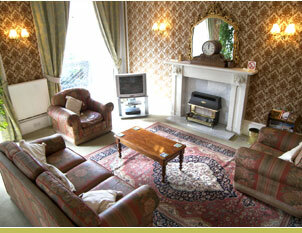 We are happy to quote for different numbers of guests. 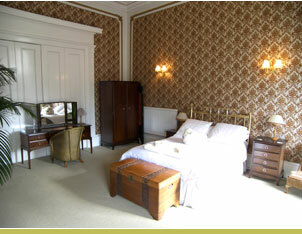 Beds for up to 6 can be organised on request and we can accommodate larger groups over multiple apartments. Please contact us with your requirements! 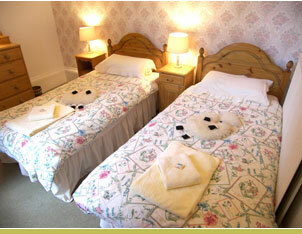 Sleeps up to 5 (1 double bed, 2 single beds, 1 fold-up single bed). 12 Acres of magnificent private gardens with putting green, tennis court & swings. On-street parking available (metered 8.30am to 5.30pm Mon -Fri, except on public holidays due to central location). Free parking within 5 minute's walk. 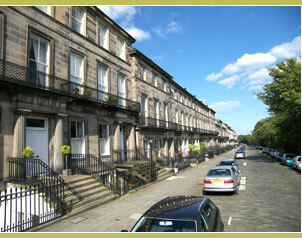 One of Edinburgh's most prestigious addresses, Regent Terrace is an A-listed, cobbled Georgian terrace with period lighting.